Origin and Habitat: Collected by A. Lau (L058), March, 1971, 1900-2000 m. alt., from a N-facing granite outcrop S of Acultzingo, Veracruz, Mexico. 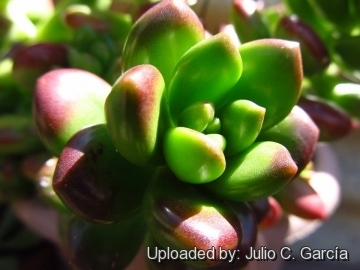 Description: Sedum lucidum is a hairless perennial succulent shrub to 20 cm high and has distinctive rosettes of very fat, lustrous, green leaves edged in red in bright light. 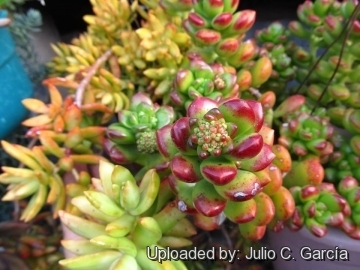 The other thick-leaved species of Sedum of the Trans-Mexican Volcanic Belt have leaves which are glaucous or dull green. It produces pretty little white flowers in winter. Sedum lucidum “obesum”: This is a selected form with fatter, rounder, glossy green leaves that take on an awesome cherry-red colour in full sun. It is a compact very smooth and shining succulent form, originally distributed as ISI 1497 in 1984 by the the Huntington Botanical Gardens. In all other characteristics, namely size and shape, flowers, fruits, roots etc. it is very similar to the standard species. Stems: Erect to prostrate, up to 20(-45) cm long, 4-5 mm in diameter, reluctant to drop basal leaves, later naked, grey or reddish, green when young. Rosettes: Tight, at the end of stems, 5-4.5 cm across with ca. 19 leaves. Leaves: Alternate, elliptic to oblanceolate or spathulate, stalkless, acute to obtuse, (1.4-)2.5-2.7(-5) cm long, 1-1.9 cm thick, smooth, dark green with pink in them, shining (especially young leaves) ca. 5 cm long, 5-8 mm thick. Upper face flat or convex, lover face convex. Apex rounded. Margin entire. Inflorescences: Tight pleiochasial cymes (cymes with three or more lateral axes) up to 7.5 cm long reddish to greenish, sprouting out of the ends of the stems, with glossy bracts and sepals. Flowering branches 1-3, 3.5-4.5 cm long. Bracts of peduncle 5-9 alternate, appressed, oblanceolate 4.5 cm long, 2.4 cm broad and up to 1 cm thick persistent green reddish at apex. Bracteoles oblong-lanceolate, ca 5.5 mm long and 1.5 mm wide, pale green, acuminate. Pedicels, short less than 7 mm long, and 1 mm in diameter, slightly turbinate, pale green, usually with small bracteoles. The bracts turn bright colours making the overall blossom colour appear pink. Flowers: White, yellow-centred, with musky scent, 9-11mm across. Sepals free, lanceolate, ca 2.7 mm long and 1.5 mm wide, apex pointed. Petals white, lanceolate or elliptic-oblong, obtuse or acute 5 mm long, 2.6 mm wide, slightly channelled in the middle. Stamens 10, white, approx 4.6 mm long. Anthers yellows. Carpels 2.4 mm high, 0.9 mm wide, pale green. Style 1.1 mm long, pale green. Blooming season: Late autumn to early spring. Sedum lucidum obesum: has fatter, rounder, glossy green leaves that take on an awesome cherry-red colour in full sun. South of Acultzingo, Veracruz, Mexico. 5) Chazaro Basanez, M. J. “Crassulaceae del Centro de Veracruz y Zona Limitrofe de Puebla, II.” Cact. Suc. Mex. 35(4): 83–90. 1990. 6) CONABIO. “Catálogo taxonómico de especies de México.” 1. In Ca. nat. México. CONABIO, Mexico City. 20096. Cultivation and Propagation: Sedum lucidum obesum grows as a small-scale ground-cover, branching and also making offsets from the base to form a clump which spreads outward over time. Great scrambler in the ground if soil is well-drained, especially trained over or around a rock. Its stems grow to about 20 cm in length and it makes an excellent plant for a hanging basket. 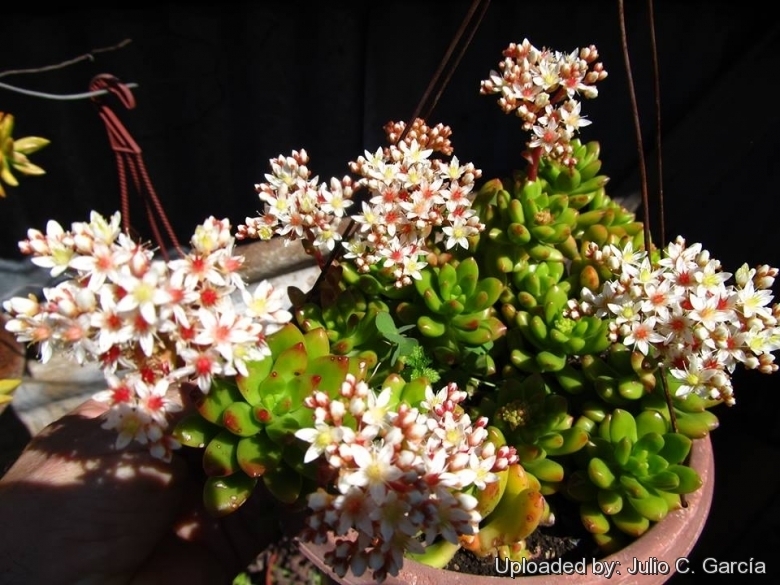 Sedums is an easily grown succulent that can tolerate sun, shade, moist soils, dry soils, but looks its best only when given adequate light levels and water, and ideally should be grown outdoors in full sun. With its extreme drought resistance, S. lucidum needs only minimal care to reward you with its attractive texture. Exposure: It prefers likes a full sun position or light shade with ample airflow. Bright light is required to prevent "stretching" of Sedums ("stretching" occurs when a moderately fast growing plant such as an Sedum, is grown in dim light or over-fertilized, which causes overly lush growth that contributes to weak, pallid plants). However, when moving plants from lower light conditions into full sun, be wary of sun scorch resulting from too rapid a transition into intense summer sunlight, most easily avoided by ensuring plants are well-watered before moving them on a cloudy day.